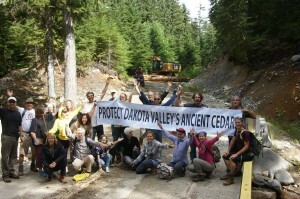 Members of Elphinstone Logging Focus (ELF) have formed a blockade to stop road building on Mount Elphinstone that would allow for harvesting of what the group calls a black bear sanctuary in timber sale area A87126. ELF founding member Ross Muirhead said he was alerted to the road building on Aug. 9 while he was taking part in a forest walk with members of the public. “We knew they were going to go in sometime this month, but we didn’t know when,” Muirhead said, adding the group “stumbled across” a contractor working to reactivate the Dakota Creek forest service road that Sunday. A blockade was set up immediately and the contractor left for the day, Muirhead said. ELF now has a rotation of protesters taking turns blocking the roadway and there is a small contingent of protesters camped out at the site. “We have a committed crew that’s dedicated to being there 24-7,” Muirhead said. ELF hired two professionals to check the area for bear dens and culturally modified trees, and Muirhead said both have been found in abundance in the cutblock. McCrory Wildlife Services was hired to do a black bear den study in the area and Muirhead said the study found several black bear den sites. “At the end of the day he turned to me and said, ‘Ross, where you’ve taken me I’ve seen more black bear den sites in one day than in my whole 40-year career,’” Muirhead said. Another expert who studied the presence of culturally modified trees in the area also confirmed the existence of at least six trees that had been bark-stripped in the past, which Muirhead said made the area more valuable for protection by the Ministry of Forests, Lands and Natural Resource Operations. To view the report click here. But the ministry’s experts disagree with ELF’s findings, saying the block doesn’t contain bear den habitat and that there was a “low potential for culturally modified trees and other archaeological sites” in the area. “The ministry’s large carnivore specialist visited the area [at the request of BC Timber Sales] and did not find any special habitat for bears, and noted that there is abundant and better habitat for bears and bear dens elsewhere in the watershed,” said Greig Bethel, media relations person with the ministry. ELF is challenging the ministry’s findings and has secured a lawyer to press for additional studies of the area before any more road building or logging takes place. The lawyer will also defend members of ELF in the event that BC Timber Sales seeks an injunction to remove protesters from the mountain, Muirhead said. Bethel noted that BC Timber Sales is currently “considering its options” to seek an injunction to stop the blockade by ELF, but that nothing has been decided yet. Once road construction is complete, BC Timber Sales plans to put the timber sale licence for A87126 up for bid. Drive up B & K Rd, (east of Cliff Gilker Park), past the power lines, keep on main road heading straight in a NE direction. (ie: do not turn left at Roberts-Flume FSR). Keep on driving for 10 mins. then see the road making a hard Left going due North. Drive for 10-12 mins. straight up, until road takes a hard Left down a hill. At the bottom of this short hill you’ll see metal culverts stacked up – turn Right here and you’ll see the tents and camp. Please bring some food, and drinks for the people there. Awesome you’re planning on going up. ELF does not like to block ordinary workers from going to a job site, however when required to stop needless destruction of bio-diversity values, and when the Province ignores good science that recommends protection, then we feel its the ethical position to take, and is a form of peaceful protest that all citizens have a right to. 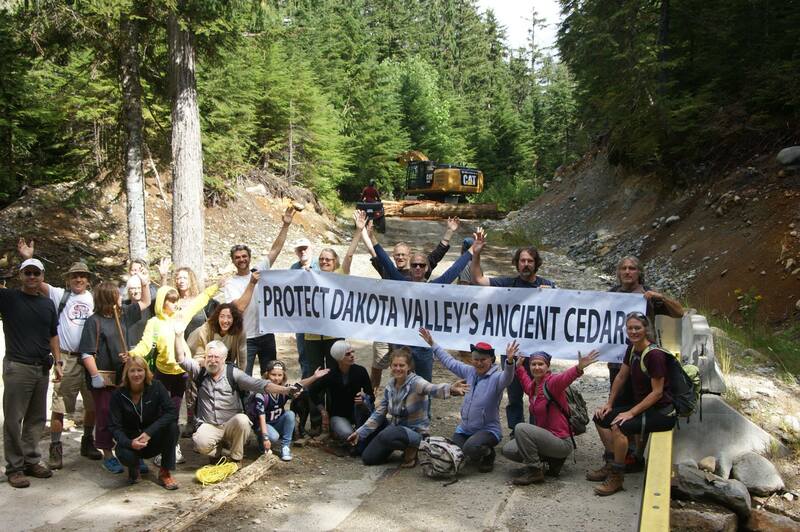 We are hopeful that in this case BCTS, acknowledges the science we’re bringing forward defers the logging, & halts the road building taking a 2nd sober look at the impacts logging will have on these Dakota Valley Forests. BTW: ELF has informed all concerned citizens involved, that they should not touch or tamper with any supplies or equipment left at this site. We had a productive 2 hour discussion today (8-11-2015) with a BCTS Forester at the site that was civil and he even listened to a live song performed by Kira, then we coverage a whole range of topics. Thanks to Russel Brewer, RPF for stepping outside his comfort zone to speak with us. We trust he takes back to his bosses the concerns raised, and recommends a deferral. Check out our Facebook page for further details, comments and pictures. Thank you.